Fumy is a software that stands out for its good compromise between ease of use and realistic results. It is indeed capable of reproducing more than successful smoke effects. To do this, the software offers a brush that the user can fully configure to have various results. It is possible to adjust different properties, such as line fineness, brightness or color. The software also allows you to specify the smoke density and a gradient can also be applied. 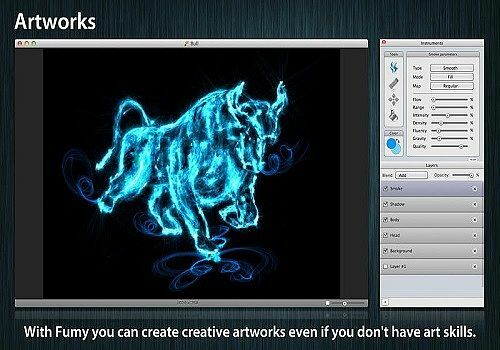 With Fumy, the user will not only be able to create original abstract drawings, but also import images and add one of the three proposed effects. Besides smoke, the software also offers the vague or flash style. Using the software is relatively simple, just set the different options and let the brush slide. As for the interface, it is very simple. It is composed of two independent pallets. One displays the drawing being created or the image to be modified while the other offers all the features and settings.